Unfinished Project: Day 241: Bacon What? On Day 241, Mo and I went to eat at P'Cheen, a fabulous pub in Inman Park that offers All-You-Can-Eat Crab Legs on Wednesday nights. "Sure," I said, when Mo suggested we go there. Because quite frankly, I hadn't been eating enough lately. Except I had. If the previous five summers have been the Summers of Weddings, then I would have to call this summer, the Summer of Eating. My appetite has been out of control. But eating crab legs wasn't the thing that I'd never done before. Eating crab legs All-You-Can-Eat style wasn't it either. My family has been going to Oak Island, North Carolina every summer since I was a baby, and there is a local restaurant there, Jones' Seafood House, that has been doing All-You-Can-Eat crab legs for years. No surprise, the Gallmans are huge fans. True, I hadn't participated in P'Cheen's version of Crab Leg night, but that seemed a little lame as the thing I'd never done before. I did run into two people from my hometown and almost fell out of my chair when I found out they not only lived in Atlanta now, but are dating each other. We reminisced about seeing Wayne's World six Friday nights in a row in 6th grade and starring in Mrs. Vogel's riveting productions of Beauty and the Beast and Newsies in middle school. I think Mo checked out mentally during that trip down memory lane, and I can't say I blame him. I was annoyed with myself, taking my unusually deep voice to abnormally high levels, squealing over this couple that I hadn't seen in at least ten years. It was awkward for me, and I was a participant in the conversation. After finishing our meal, Mo and I left P'Cheen in search of the thing I've never done before, and for some reason, we decided that two beers and two plates of crab legs was just simply not enough food. Only it was plenty. That meal was more than enough. But I have an eating problem. And the problem is that I eat too much. So we walked down to Irwin Street Market where Justin had earlier suggested we go to eat Jake's Ice cream. According to him, it's the best ice cream in Atlanta. Irwin Street Market is on Irwin Street (crazy, right?) and it's a colorfully decorated space that houses several vendors, including a southern cooking diner type restaurant and some local artists displaying their work. Mo asked the lady behind the ice cream counter if she could make me a banana split, since in all my 29 years, I've never eaten one. Thanks to the crab legs, I'd stretched my stomach enough so I had room to make it possible. She shook her head and said, "No, I'm sorry, we don't have any bananas." "What am I going to do?" I said to Mo nervously. Again, technically, eating Jake's ice cream at Irwin Street Market is something that I had never done, but enough with the food already. 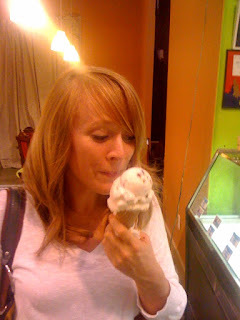 We began to peruse the flavors, because regardless of what did or did not happen as Day 241's "thing," I was not leaving without eating ice cream. "What's this one?," I asked, pointing at the sign labeled, "Happy as a Pig in Chocolate." 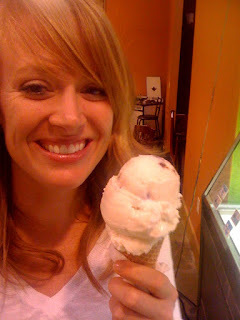 She smiled as she said, "That's vanilla ice cream with pieces of chocolate covered bacon in it." I turned my head sharply at Mo and raised my eyebrows, a big smile grew on both of our faces. "Well there you go," he said. Day 241's thing I've never done before is to eat chocolate covered bacon ice cream. I admit, there were about 15 other flavors in that case that I would've rather tried than this one, but trying new things is what this year is all about, so while I wanted to stomp my feet and spin around like a 3-year old throwing a temper tantrum, screaming, "I don't wannnna eat that, I wanna eat Rocky Road!!!! !," I resisted the urge and just went for it. She fixed us both a cone and I took a bite. The flavors confused me and I have to assume that chocolate covered bacon (which exists far and wide beyond Jake's ice cream) was created as an accident, or by some optimistic chef thought two flavors that were good on their own must be good together. I don't know that I would agree with that chef. I mean, the ice cream wasn't terrible. I didn't want to gag or anything. But I probably wouldn't choose it again. Part of it was a texture thing. Just as I would start to enjoy the chocolate, my taste buds would get rocked with the salty bacon and it was all just too much. And it was chewy. If I'm going to have to chew ice cream I prefer it to be because of Oreos or Heath bars or some other candy bar. 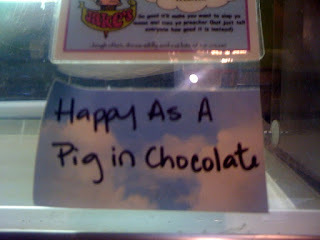 So Pigs in Chocolate: not awesome. But the night was pretty great. 1) P'Cheen has an All You Can Eat crableg night, wha? Is it good? 2)Newsies...greatest musical that I like to sing almost ever song to EVER! I'm the king of New York! 3)Bacon in anything...mmmm. Katie would agree. they do have a bacon/bourbon drink at d.b.a. (if you wanted to venture back).